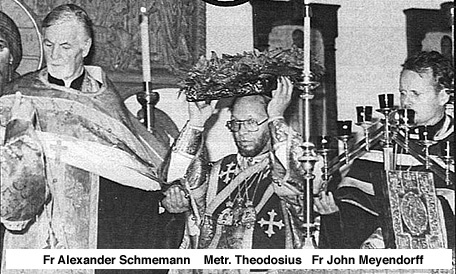 Protopresbyter Alexander Schmemann: Metropolitan Theodosius, "AMEN"
During the last year of Fr Alexander Schmemanns life, as illness slowly claimed his body and drained him of his physical strength, the Church in America was moved again and again to express her love for him and her gratitude to him. As theologian and teacher, as pastor and preacher, as confessor and celebrant of the holy mysteries, Fr Alexander was for all of us a guide and an inspiration, a rule of faith and an image of faithfulness. Today, as we prepare to give the last kiss to Fr Alexander, with the eyes of faith and love we see even more clearly than before what God has given us through Fr Alexanders ministry, and the great loss we have sustained in his death. So much of what we now take for granted in our Churchs spiritual and liturgical life has been implanted, cultivated and nourished by Fr Alexanders teaching. In season and out of season, he was an eloquent and tireless witness to the living Orthodox tradition. At the heart of his approach to theology was the insight, which sees the living connection between the worship of the Church and the Christian faith. This insight enabled Fr Alexander literally to open our eyes to the Eucharist, to what the Divine Liturgy is and what it says and what it means. Through Fr Alexanders labors, energy, and inspiring guidance, St Vladimirs Seminary has become a vital center of theological education and Orthodox witness, its faculty and publications bringing Orthodox theology not only to the specialists, but to the people as well. In fact, Fr Alexander did not see Orthodox theology as the recirculation of theological ideas among specialists, but rather as the ministry of truth in the Churchs life, a ministry profoundly related to the pastoral task of the Church. It was precisely the demands truth makes upon us and the pastoral needs of the Church which led him to be an advocate of organic Orthodox unity in America. In his creative contribution to the establishment of the autocephalous Orthodox Church in America in 1970 he was moved by a vision of the unity of Orthodox ethnic jurisdictions in North America. There are many outside the Orthodox Church who have been deeply touched by the Orthodox witness because they have been touched by Fr Alexander through his books and lectures. Finally, millions of believers and unbelievers in the Soviet Union have been nourished by the word of Gods truth because they listened to his sermons broadcast for thirty years on "Radio Liberty." Fr Alexander witnessed to Christ in his teaching and preaching. Through the testimony of his life he made Christ present to many. The charism of teaching was given to him by God to the very end. In death and dying, in the ultimate humiliation and weakness of terminal illness, he showed by his example the meaning of suffering in the Christian life. There is a passage "the sacrament of healing" in Fr Alexanders best-known book, For the Life of the World, which reveals the rich meaning of this sacrament. The Church does not come to restore health in this man, simply to replace medicine when medicine has exhausted its own possibilities. The Church comes to take this man into the Love, the Light, and the Life of Christ. It comes not merely to "comfort" him in his sufferings, not to "help" him, but to make him a "martyr," a witness to Christ in his very sufferings. A martyr is one who beholds "the heavens opened, and the Son of Man standing on the right hand of God" (Acts 7:56). A martyr is one for whom God is not another  and the last  chance to stop the awful pain; God is his very life, and thus every thing in his life comes to God, and ascends to the fullness of Love. Several days before his death, as Fr Alexander suffered on his bed of infirmity, the sacrament of healing was performed for him. Fr Alexander had no strength in him. He was quite unable to converse. What he did say, clearly and firmly, at the appropriate moment in the sacramental rite, was "Amen. Amen. Amen." We have just participated in the sacrament of love and thanksgiving, the holy Eucharist, and at the consecration of the bread and wine we affirmed what Christ does "for the life of the world" by saying "Amen. Amen. Amen." As we give Fr Alexander the last kiss we are thankful to God that in Fr Alexander He gave to us a teacher and pastor, a friend and colleague, a guide and counselor, a husband, brother, father, and grandfather. As the Apostle says, "we do not grieve as others do who have no hope," but live and die in the knowledge that "none of us lives to himself, and none of us dies to himself. If we live, we live to the Lord, and if we die, we die to the Lord; so then, whether we live or whether we die, we are the Lords. For to this end Christ died and lived again that He might be Lord both of the dead and of the living." Affirming this apostolic teaching, affirming the witness of Fr Alexander in life and in death, affirming our deep love for Fr Alexander, with confidence in Gods mercy we commend Fr Alexander, ourselves and each other to Christ our God and say, Amen. Amen. Amen. St. Vladimirs Theological Quarterly, Vol. 28, No. 1, 1984, pp. 33-35.